Couldn’t put together a successful tree-stand hunt this year. My plan to invest my time on days with the best moon phase back fired as the weather didn’t cooperate. Cool weather set in and that wasn’t the best for my tree stand as its success depended upon the deer using the nearby pond. On the last attempt, not only was the weather cool, but the wind was inconsistent and blustery. I finally gave up when it shifted and blew directly towards the pond. Definitely no way to hunt deer. Five yearling deer came in to drink, but didn't stick around very long. 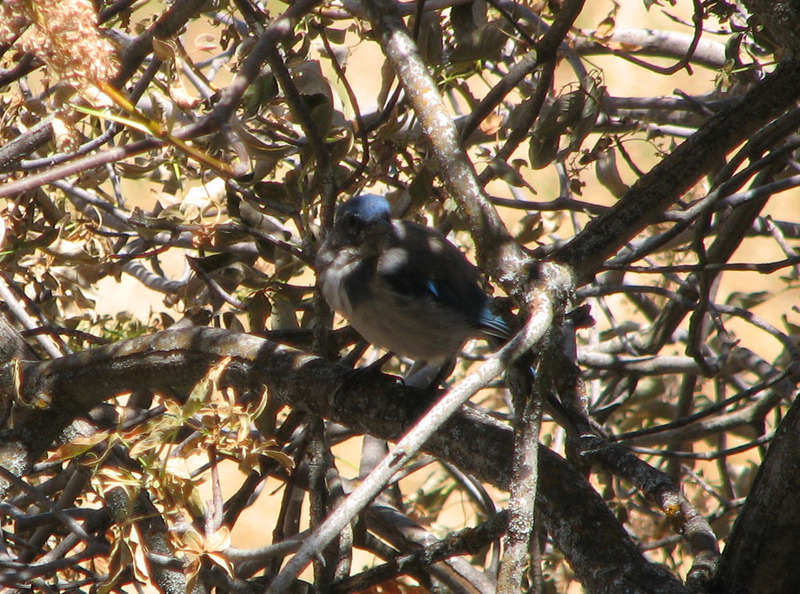 Scrub jays and squirrels were hanging around. This guy checked me out. 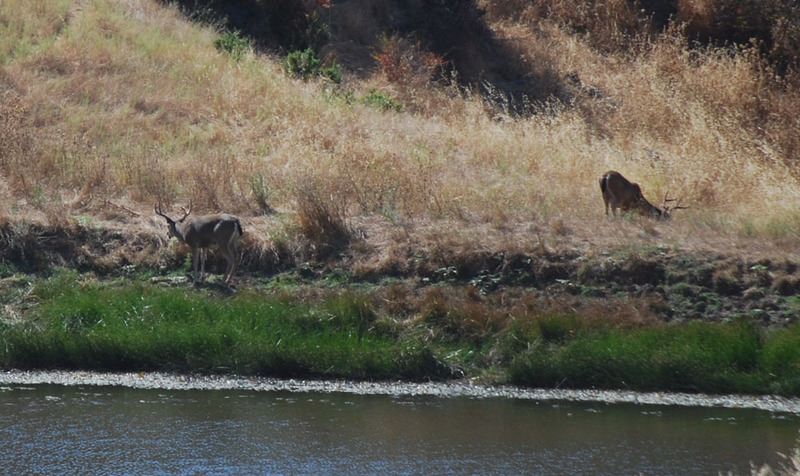 On the way home, I photographed a couple bucks feeding on the dam of a pond. The one on the left is probably a shooter. I don’t think he’s an old deer, but he would probably have drawn fire. A couple blacktail bucks feeding in the afternoon. How many times have I purchased title insurance over the years? Can’t even imagine. It’s one of those expenses that you assume you must do, and you must if you have a lender, or you won’t get a loan. However, if you’re purchasing ranch property and you pay cash, you may think about taking a pass on title insurance, and I’ve done that. However, I’ve learned something about title insurance this past year and now I’m a believer. When you have a title guarantee provided by title insurance, you are not only protected to the dollar amount you paid for, but you also are entitled to the cost of legal defense of your claim. In other words, the title company must pay to establish whether or not the title problem you encounter really exists. The cost of resolving a legal issue can be the most expensive part of solving a title problem and the coverage by the title company, with regard to the legal defense, is not limited. There are several ramifications of this, but the most important is that because you are backed by big money, you are on a level playing field with almost any adversary and legal issues are sometimes resolved on the basis of the law, but more often are resolved by the size of the bankroll of those in the dispute. With the title company on your side, you are much more likely to come out with a win or at least an acceptable compromise. It’s almost as if the fact that you are insured makes it true. How valuable is that? Per my plan, yesterday was a hunt day. Arriving in my stand about 10:00 AM, I sat until 1:45 PM and then got down to take a look at a pond improvement project with Rob. I have to admit the work site looked pretty rough. Lots of grass covering rock hard dirt that we’ll have to excavate by hand to make sure we don’t hurt any critters. 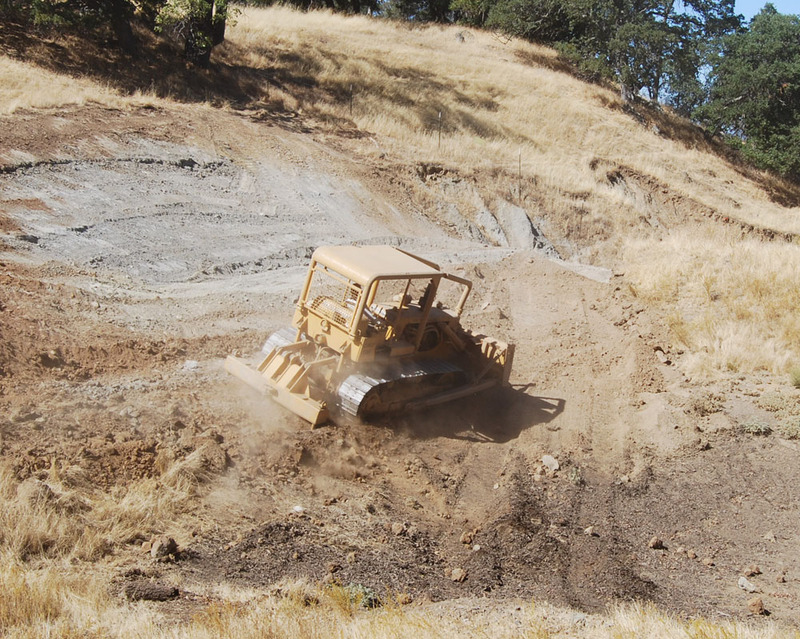 A bull dozer could do finish the work in an hour, but it will take us several days, with Rob doing the bulk of the work. Back to the tree about 3:30 and five yearling deer including one legal buck were bedded about 100 yards from my stand as I climbed up. The five deer walked right past my stand before laying down. Stayed in the stand until 6:30 PM when the wind shifted to down hill making it very unlikely that anything good might happen. The high point of the hunt was when this hen turkey arrived with at least eight polts. Like the quail, the turkey must have been late nesting as the polts are quite small. 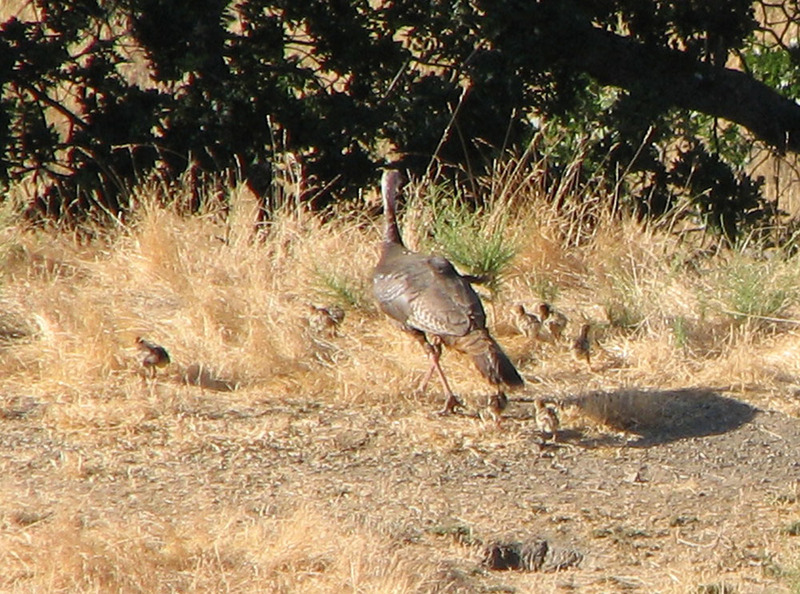 We don't normally find turkeys in the canyon, so maybe this brood will be the start of something good. Tomorrow will be my last archery deer hunt for this year. I’m hunting during the day as that’s the only time when the wind is good for this site. I’m also scouting around looking for a site that will work during the morning and evening breezes, but they are hard to find. Maybe by next season. 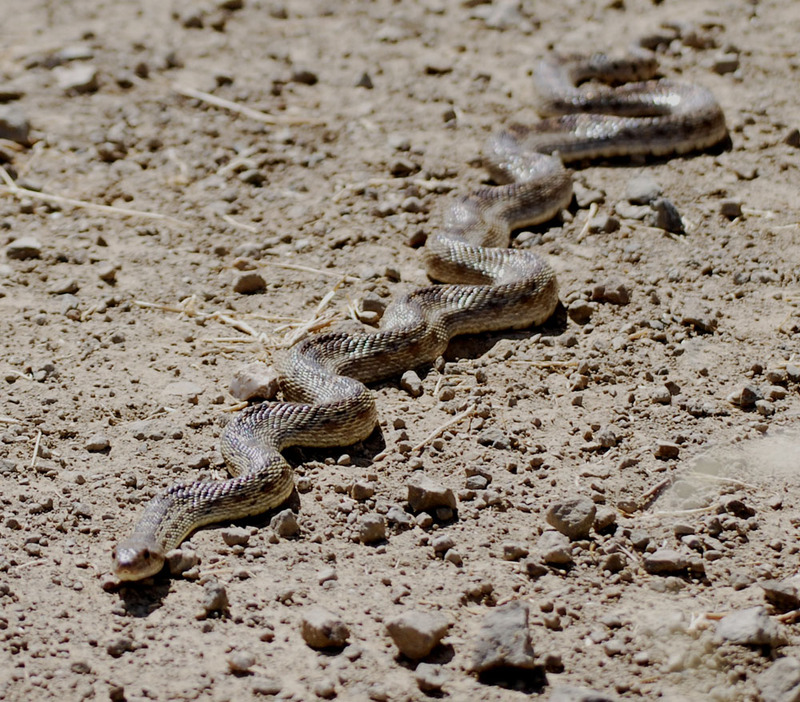 Snakes, like this gopher snake, like roads for sunning themselves. Yesterday was a very hot day at the ranch. I chose not to hunt, just scout and prepare for next weekend. As I drove past my tree stand I noticed that a doe was laying in the shade about 15 yards from my seat. Wonder if I buck had been around. Quail were everywhere and many were quite small. As I drove the four wheeler down a road through brush, something very small darted in front of me. 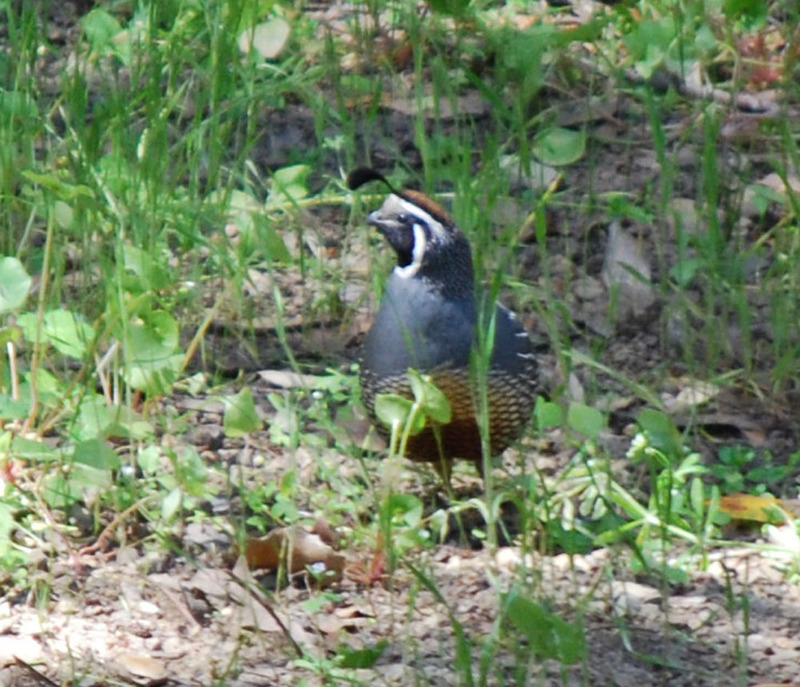 I was shocked to see two baby quail about two inches tall running directly in front. I slammed on the brakes and barely avoided them. Last year the quail were about three quarters grown by archery season. This year none of them were half grown. Must be due to the late spring, but there are sure a lot of them. Jumped a nice buck near the site where our friend Joe shot a very good buck last year. Good buck spot. Put my ground blind near a stock pond and added some brush around it. Two does and a fawn were standing near it when I returned a while later. Maybe it will work out. Checked out a new pond for tracks thinking it might be another tree-stand site. Not hardly a track at the pond. Wonder if the water is poor. It was so hot that I could barely function. Decided to leave for home about 6:30 and drove my bike right over the front of my trailer raming into the back of my car. Fortunatly it just bounced off the spare tire and left me with the front wheels over the front rail of the trailer. Pretty exciting, but I just drove it back off. No harm no fowl. Ran over a very large rattle snake on the way home. I normally watch for snakes, but with the sun low and my sunglasses on, I didn’t realize it was a snake until the deed was done. Hated seeing the smashed rattler wiggling in the road. He was a four footer and quite fat. Thought about taking a picture of the disembowled snake, but that would have been too rude. He was also somewhat alive so I dispatched him with my shovel. 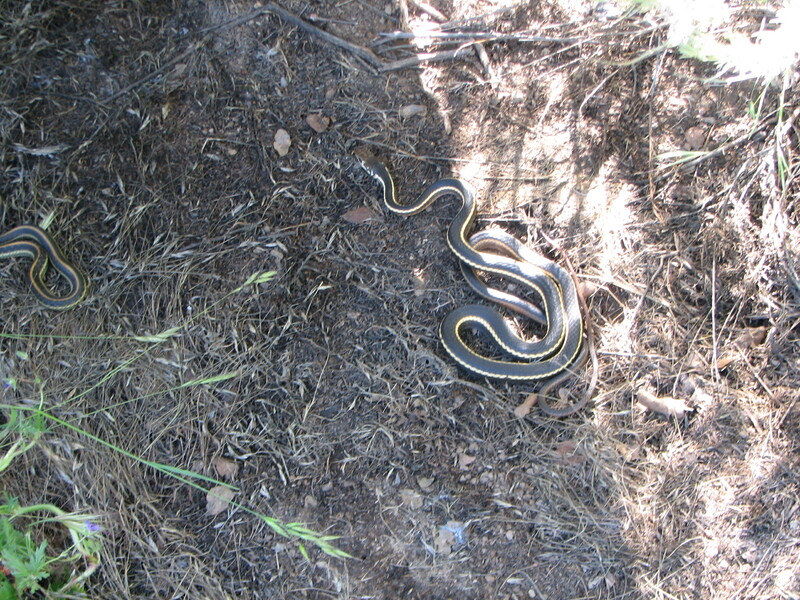 For some reason I like snakes – not to play with like we did when we were kids, but just to watch and I hate running over them. Are Wildlife Management Programs Going Astray? 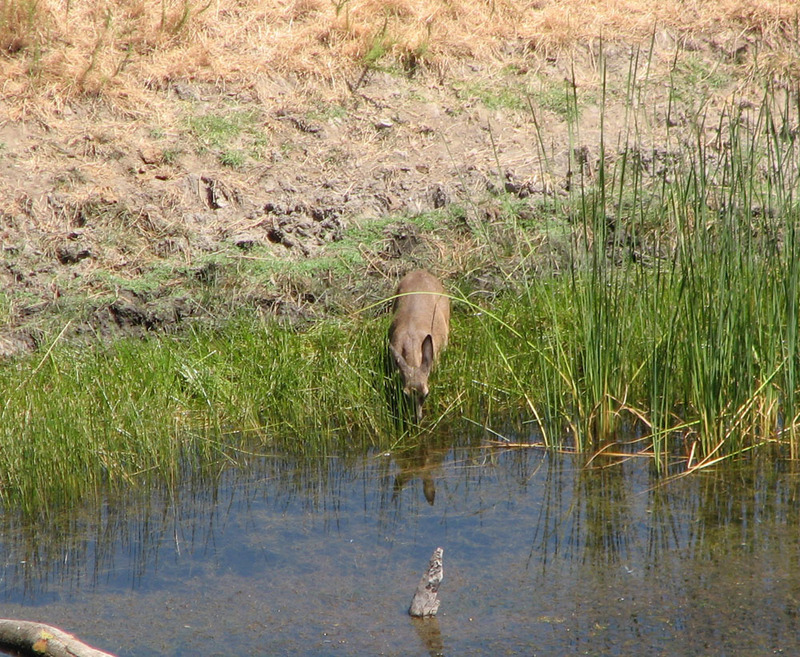 Traditional wildlife management is based upon an assumption of consumptive use. With consumptive use as a goal, habitat is managed to produce a healthy wildlife population with some species targeted for harvest. 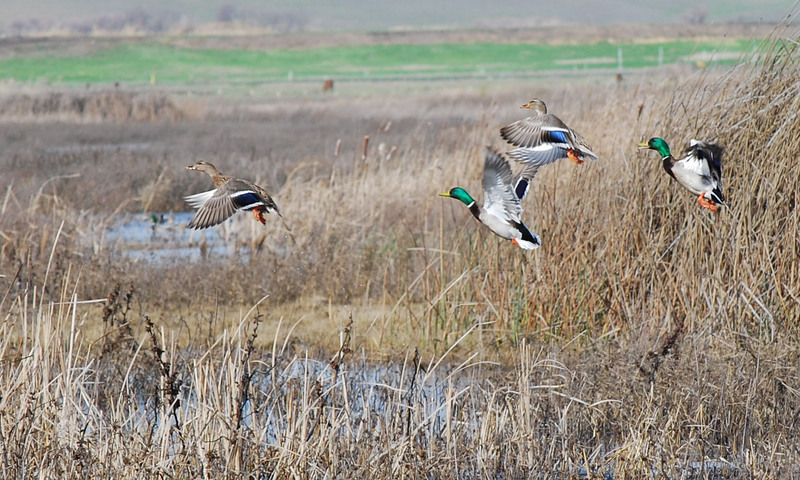 Healthy habitat produces a surplus of the targeted species, the ones desirable for human use. The surplus is available for consumption, with no net loss of the base population. This scenario is a win-win situation. More animals overall and also more available for harvest. Since consumption requires killing the animal being consumed, the sacrifice of the individual life of an animal is accepted, but the welfare of the target species, whether it be a herd, flock or family group, is enhanced. 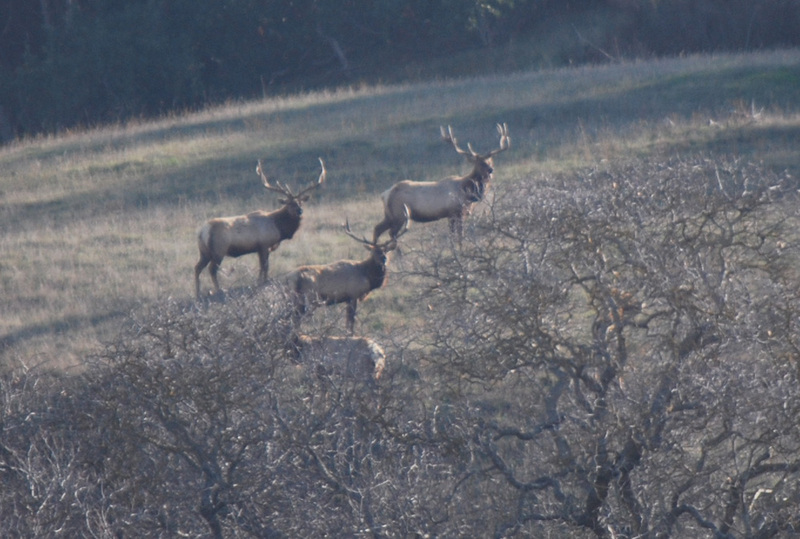 Tule elk were once on the verge of extinction, but hunters brought them back. The Endangered Species Act has helped to promote the plight of numerous species which have been or are threatened and endangered to the point that the species could become extinct. But, the philosophy of the endangered species act tends to promote the welfare of each animal as an individual. This is appropriate if a species’ population dwindles to double digits. The killing of an individual animal listed as endangered is considered a “take” and it is illegal. That the killing of an individual animal undermines the welfare of a species seems intuitively obvious to any observer, educated in wildlife management or not. Unfortunately, there is a counter-intuitive component built into the issue of “take.” Management activities that promote the welfare of the species often require risking death or even guaranteeing death of one or more individual animals. Therefore, the killing of a limited number of individual animals should be allowed when the action taking place ultimately enhances the survival of the species as a whole, but this is not the case. You can't rebuild a pond without making a mess. 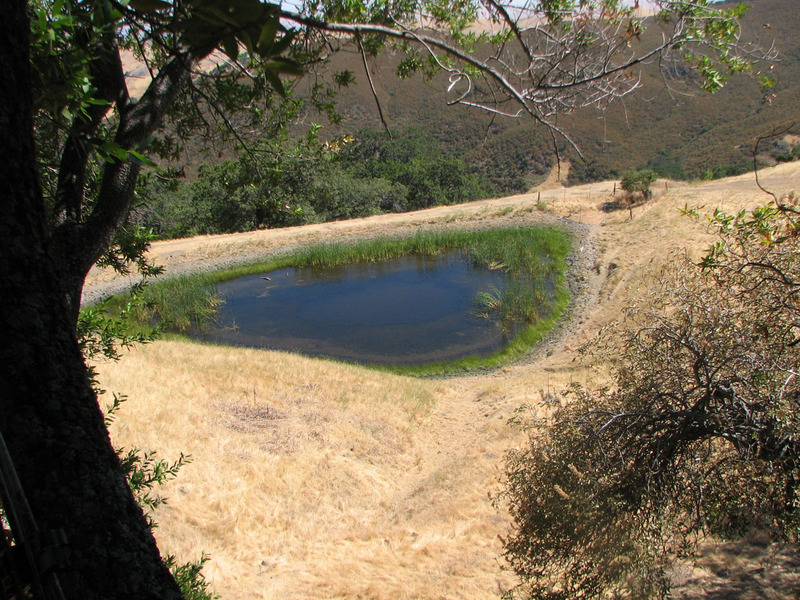 Most recently, the issue of habitat improvement work related to enhancement of California tiger salamander breeding habitat has come into play. Land stewards who wish to rebuild dams and deepen stock ponds to enhance tiger salamander breeding opportunities are foreclosed from doing do as the issuance of a permit requires that there be no take. This type of conservation strategy is referred to as avoidance or minimization of take. In fact, this strategy can backfire. 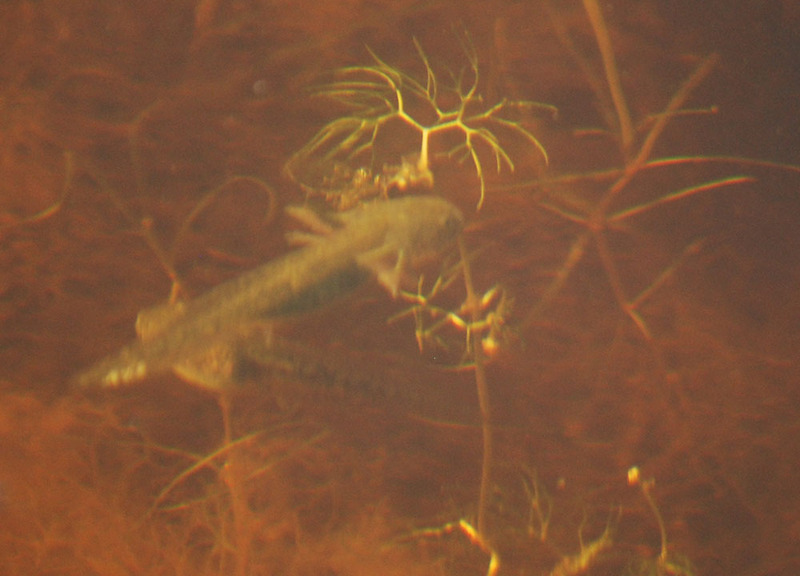 This CTS larvae, along with many others, was found in a recently rebuilt pond. 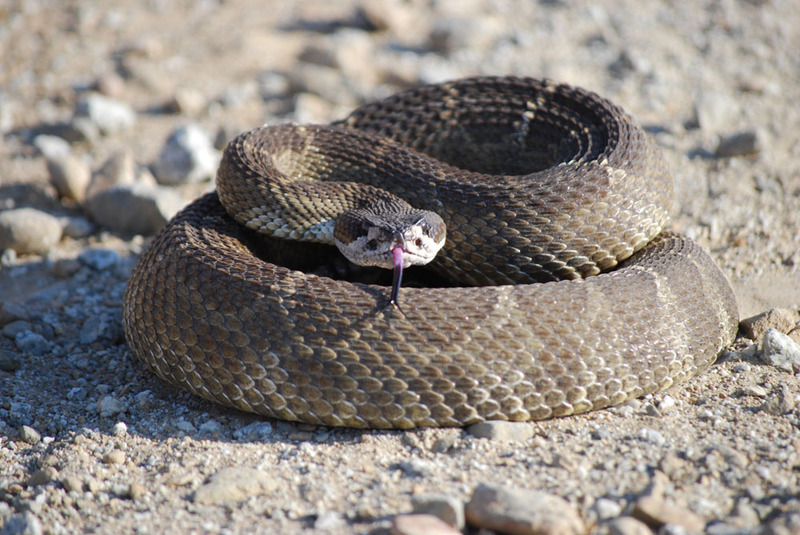 Brush that provides a sanctuary for Alameda whipsnake and many other species, should be thinned periodically to produce optimum habitat. Burning is often the prefered method, but mechanical clearing, crushing or pruning are other techniques that produces results. Unfortunately, none of these options can currently be used by land stewards for fear that an individual snake will be killed. Under current rules, there are few if any options that will allow a permit necessary to take one animal under these circumstances. If this type of thinking creeps into the minds of some traditional wildlife managers and the welfare of an individual animal is raised above the welfare of habitat supporting the species in general, we have a big problem. Habitat may not be warm and cuddly, but proper management of the critical habitat for a species must take priority over the welfare of individual animals. An interesting thing I’ve learned over the past couple deer hunting seasons is that my GPS can help me determine the best times to hunt and fish. Yes there is a program on my Garmin eTrex Legend called “Hunt and Fish.” After establishing the location, you enter the date and the GPS unit tells you if it’s a good day or not. The date can be rated poor, average, good or excellent. I’ve noticed that good and excellent days definitely seem to have more activity. For July the 24th and 25th are rated good and the 26th is rated excellent. I guess I’ll be out there on those days. The GPS unit also states which hours of the day are best. Might as well give it a shot. I’m becoming a believer. Opening day got me excited. I felt well prepared as I climbed into my treestand about 11:00 AM on Saturday. Not quite as early as I would have liked, but I figured the best chance would be during the afternoon heat. 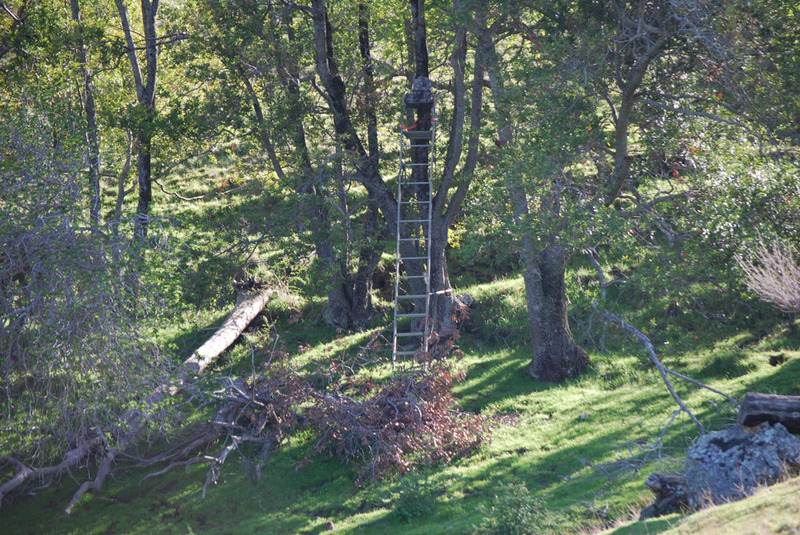 My tree stand was well positioned, but by the end of the day, I decided to shift it a little before I left. It was a long day. I sat until 6:30 PM and then climbed the hill after movnig the stand a few feet to make shooting a little easier. Wildlife was all around me, but the position of the stand did not give me many chances to take interesting photos. A yearling doe came in to drink about noon. It was the last deer of the day. 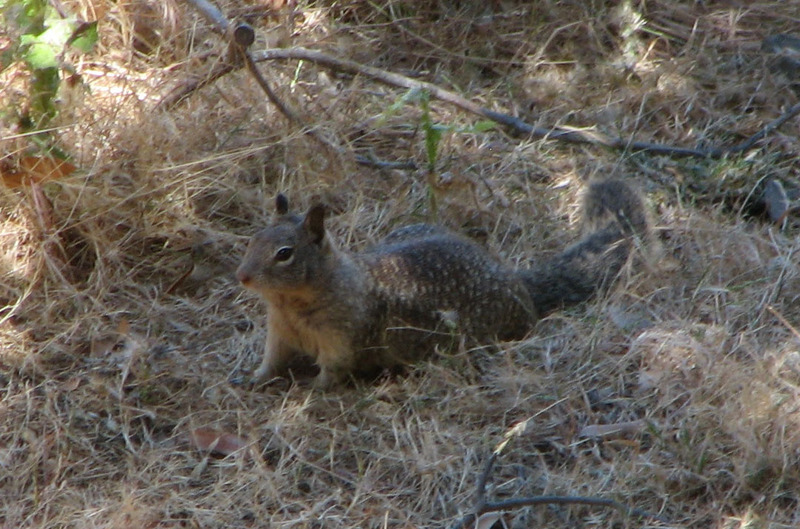 I spent quite a bit of time studying California ground squirrels which were feeding around the base of the trees. It looked like a family with several very young squirrels and a couple of larger ones. The moved very slowly keeping a low profile. I’ll be checking my GPS for the best times and planning my next trip soon.